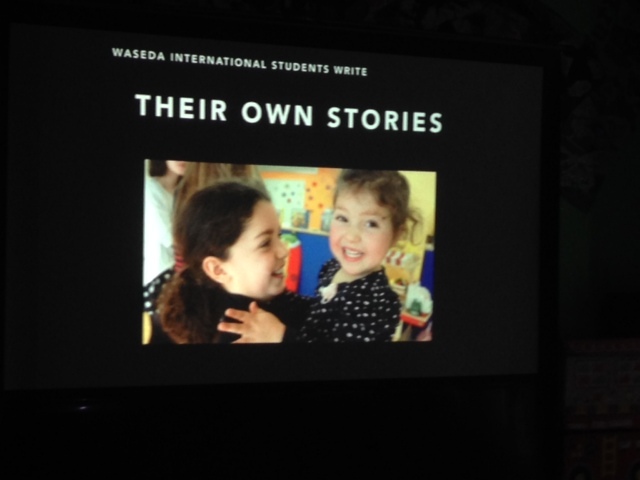 Second Author Visit at Waseda International School! In the rush to make the train, Baabara the lamb puppet got left behind. A substitute puppet was quickly crafted from a sock, googly eyes and yarn pom-pons. He filled in for Baabara in his own goofy way for the short introduction given to the preschool group for the first presentation. As we moved on to the main event, the little ones enjoyed the hikari-shibai of “Princess Ramona” projected onto a large screen that was low to the floor and on their level. This made it easy for the students to approach the screen and point out details that they discovered in the illustrations, which we could then zoom in on using the iPad touch screen. They enjoyed the grumpy knitting cat, for example, and the tiny knitting spider which they spotted in the corner of one of the illustrations. As young as these students were, and though many were English-language-learners, they still were able to sweetly verbalize the themes of the story and express their delight in the characters. The second group of students were first-through-fifth graders and they were excited to see their own stories and illustrations projected onto the big screen. We had planned for this presentation several weeks ahead and the students had collaborated in their classes to produce a pourquoi tale with original illustrations. Early in the week, their stories and illustrations had been forwarded to me. I took their submissions and created a Keynote presentation that incorporated lessons in writing, editing, and book design. For the older students’ story, for example, they were shown their original version and then an edited version that eliminated unnecessary details in a shorter, snappier version. At the end of the presentation, I read a pourquoi tale I have been working on. After the presentations, I met briefly with the fifth graders in their classroom to talk about their current language arts unit, poetry. 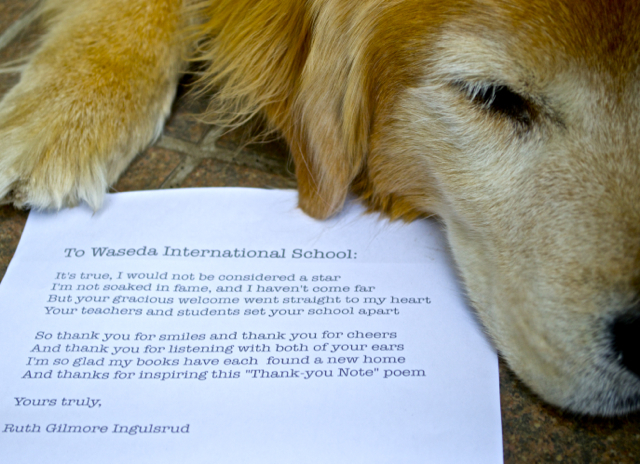 We shared a few poems that we had memorized and with that, my time at WIS was almost over. 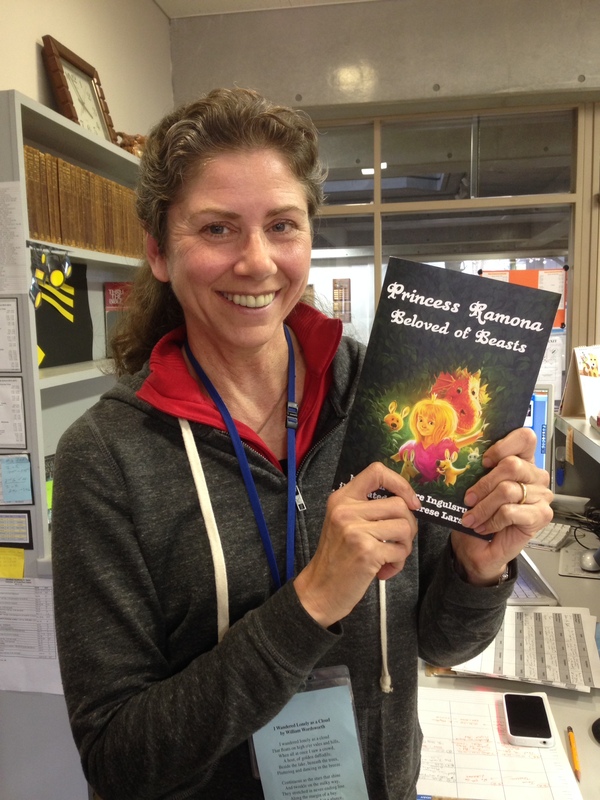 The PTA presented me with a bouquet of gorgeous flowers and I sat down to sign the stack of purchased “Princess Ramona” books. WIS had wisely prepared the list of names ahead of time which greatly helped the signing process. Most of the books were signed in time to send home with the students. Before I finished, one student came by to share a lovely little cake, as it was his birthday. I was so blessed and impressed by all of the staff and students at this school. Thank you!